Taking a statistical approach to the condition monitoring of wind turbines is helping wind energy operators control their operation and maintenance costs. SKF is using its wealth of knowledge and considerable database about thousands of wind turbines globally to develop more effective ways to predict and avoid potentially catastrophic machine failure. In doing so, they are helping to keep wind farms operating at peak efficiency and profitability. Today’s onshore wind farm operators in Europe face Operation and Maintenance (O&M) costs that represent around 20 % of the levelized cost of energy for onshore wind farms. 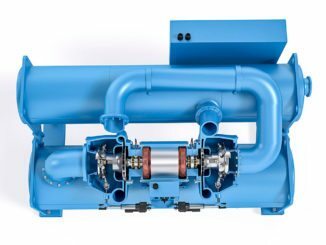 Through its statistical approach SKF hopes to bring greater efficiencies to condition monitoring and trim the total cost of wind turbine operation. Asset owners appreciate that investment in O&M is important and will continue to be a growing issue for the wind industry. As fleets of wind farms age, the likelihood is that component failures and defects will fall outside manufacturers’ warranty periods. Consequently, the importance and cost of O&M will increase. As approximately 75 % of all onshore wind turbines installed in Europe have been operating for less than 10 years, O&M will grow in relevance in the future. Condition monitoring systems (CMS) are the heart of O&M routines. Essentially, condition monitoring is the process of determining the condition of machinery while in operation. A successful condition monitoring programme includes knowing what to listen for, how to interpret it and when to put this knowledge to use. CMS not only help wind farm operators reduce the possibility of catastrophic failure, but they also enable wind farms to repair up tower as much as possible, order parts in advance, schedule manpower and machines, and plan other repairs during downtimes. Fig. 1: SKF has developed a wide range of products, services and solutions dedicated to wind energy. As a leading supplier to the wind energy industry, SKF’s expertise and knowledge about wind turbines has contributed to helping the sector develop more sophisticated tools towards lowering the cost of O&M. SKF manufactures many components (fig. 1), including bearings for the drivetrain, along with lubrication and sealing solutions. 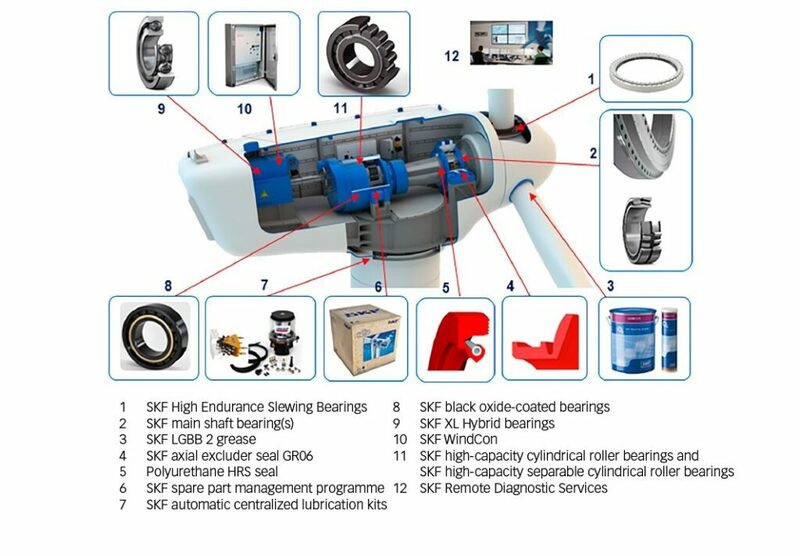 SKF has developed condition monitoring systems based on vibration monitoring and has offered remote monitoring service since 2007. 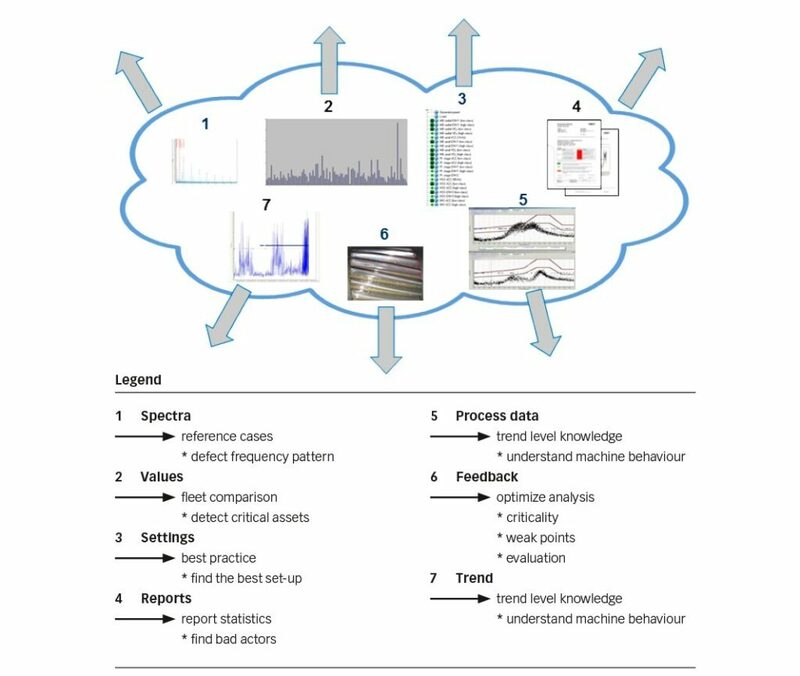 Today, this has evolved into comprehensive hosted software and monitoring services offering predictive maintenance programmes for periodic and mainly continuous monitoring of wind turbines via the Internet connection. 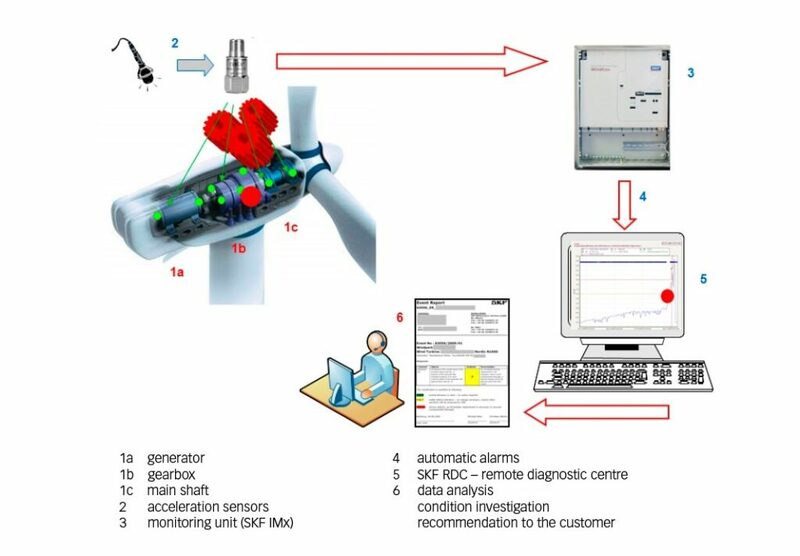 SKF Remote Monitoring Services use SKF condition monitoring tools such as the SKF IMx online system, dedicated to wind turbines, to collect data. Based on the results, experts analyse data, and use the Internet to communicate with the management of machine health for informed decision-making. Since 2005, SKF has installed more than 5,000 condition monitoring systems worldwide, of which approximately 2,000 are monitored by SKF. This fleet comprises more than 40 different types wind turbines manufactured by 15 original equipment manufacturers (OEMs). This means that via its remote monitoring centre, SKF has gathered a wealth of data related to the performance and potential failure modes. Analysis of vibration data has helped it gain an understanding of machine behaviour from a dynamic perspective. Fig. 2: How vibration monitoring is carried out. Fig. 2 shows how vibration monitoring is carried out. Data about key components within the generator, gearbox, main shaft and rotor bearings are gathered from acceleration sensors that detect vibrations. This data is collated by a monitoring unit such as the SKF IMx that sends automatic alarms to the remote data centre operated by SKF. Each turbine, depending on configuration and location, may end up having customized alarm levels that are determined during the set-up phase to ensure that the monitoring is the most efficient for that turbine. This gives patterns of machine behaviour and enables SKF to gather reference cases in relation to different types of failure. Analysis of this data has given SKF the opportunity to move CMS to a new level of performance and efficiency through the development of new statistical techniques. The volume of data collected from a large wind farm is staggering. As a rule of thumb there are approximately eight sensors on a geared wind turbine with roughly three measurements for each of them, 24 indicators in total; one indicator is one spectrum and one overall value. This information is collected by the condition monitoring hardware and is sent over the Internet, either wired or wireless, to a CMS server, which can be located anywhere on the earth. In one year, with on average one download a day, there are 9,000 spectra to analyse per wind turbine. For a wind park, which may hold hundreds of turbines, it is completely impossible to analyse this data in a meaningful way without using statistical modelling. Statistical modelling compares the turbines with one another as much as that is possible, given differences in location and models. First, SKF compares what is comparable and then uses historical data amassed over the 10 years of monitoring wind farms of different models. Based on the history of this data, and dependent on turbine type, it provides the background information for any new machine that SKF starts to monitor. A wind turbine presents unique challenges in terms of CMS that are not experienced in other industries. Wind turbines are complicated machines with a great many variables. It is not possible, for example, to apply one model of alarm level to all machines, so individual alarm models have to be developed to enable rapid comparison of those machines that can be compared. However, to attempt to do this without being guided by the statistics, filter and selection would be impossible in a reasonable amount of time. The growing pool of historical data related to wind turbine performance is extremely useful, especially if it contains the entire life cycle of a unit starting from installation. Unfortunately, this is not always the case. Even though an increasing number of turbines are factory-fitted with monitoring technology, much of the existing fleet requires retrofitting. This traditionally occurs close to the end of the warranty period or when the operator or the service provider wants to renew a service contract. It is, however, vital to select the right kinematic data to analyse in order to increase the statistical process accuracy. The system has some features that enable it to scan for potential theoretical defaults. Automatic scanning relies on the actual information about the type of components in the system. Each gearing has its own theoretical frequency, so without having a certain degree of certainty about the kinematics inside the turbine, assumptions made by the analyst need to be added. 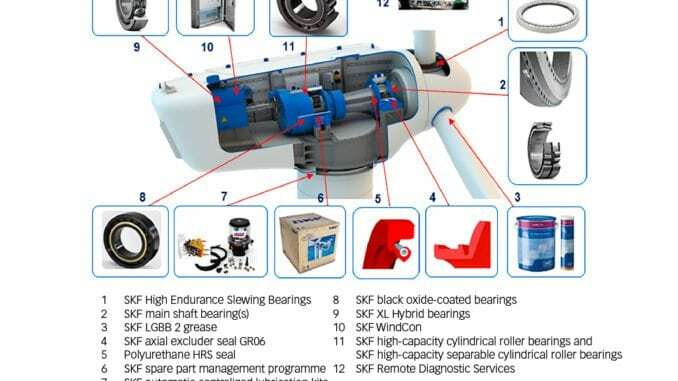 Given SKF’s extensive historical database, there is a good understanding and good knowledge about the components inside the gearbox and inside the generator. Fig. 3: Fleet analysis for wind farms. From experience it is clear that not all the components in wind turbines need the same level of expertise to be analysed. For example, detecting a generator bearing issue is quite easy, but for planetary bearings and gears, identifying an issue is much more problematic. Consequently, SKF has developed specific algorithms that focus on the detection of problems related to the planetary gearings themselves. 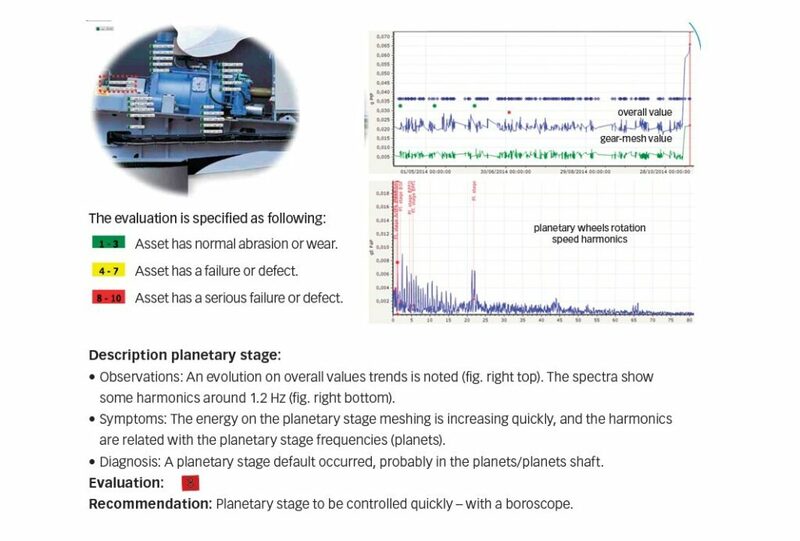 This is particularly relevant; for one customer SKF analysis showed raised harmonics on spectra for a planetary gear at 1.2 Hz, indicating that further investigation was required. Visual inspection confirmed that there was cracking in the intermediate shaft pinion that could have led to a catastrophic failure. Early intervention meant that the machine was stopped and repair could be carried out before further and more costly damage was done to the turbine. Fig. 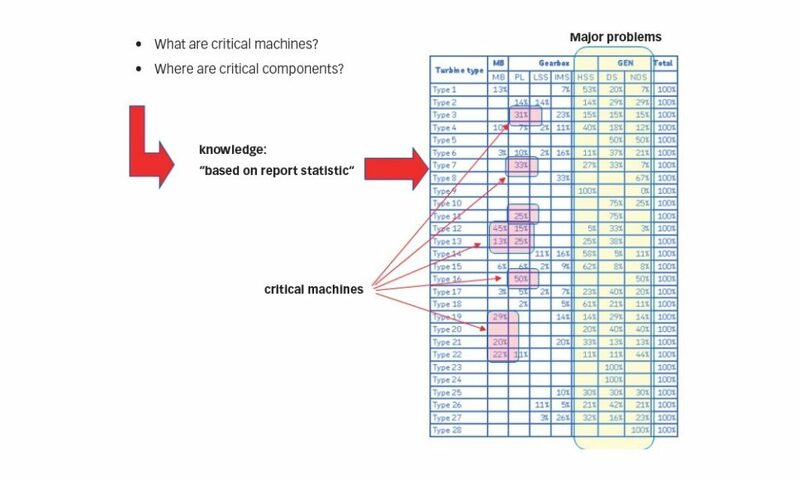 4: Using statistics to identify critical machines. The aim is to quickly identify which turbine within the fleet requires further analysis. The statistical approach complements traditional diagnostics by highlighting potential problems in a particular turbine quickly, so that specialists can spend some time looking at the vibration signals to determine any likely issues. Using its statistical modelling, SKF wants to broaden its fleet analysis capability based on the global background built up from among the more than 2,000 turbines already analysed. To achieve this, a statis-tical model will be built of vibration comparison for each turbine model and their components over various locations and loading conditions. This will be achieved by improving the process, by adding regular workshops between SKF specialists, sharing the issues and sharing the ideas of improvement, creating a global network within the wind CMS community. Fig. 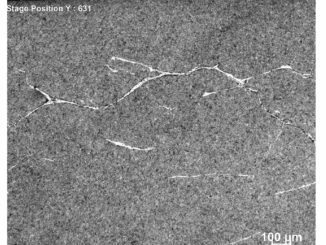 5: Data from a 2 MW wind turbine over a six-month period showed increased vibration leading to inspection and repair. Better statistical modelling will enable alarms to be tailored such that operators only receive information about an issue that is likely to have a detrimental impact on performance. To achieve improved operations, the maintenance strategy of operators needs to be shifted from a scheduled model to a predictive model. This will be aided by the fact that the accuracy and scope of CMS will continue to evolve as the boundaries of the technology are pushed. One of the next technological steps will be to integrate all the relevant sources of information such as temperature and process parameters, and add these to the diagnostics that vibration allows. The other trends are to be able to hook that CMS data to another, more holistic system again to allow better correlation. This is a major driver from the turbine manufacturers, but as always it comes down to cost. Given the high volume of wind turbines there is a lot of pressure to decrease the cost. SKF’s goal is to make the technology more affordable. After 10 years using vibration monitoring in windmills, SKF has demonstrated that CMS can improve the availability of the wind assets by 1 % while at the same time reducing operating and maintenance costs by 2 %. By utilizing SKF’s statistical-based CMS, operators can save as much as 5,000 euros per year per wind turbine. 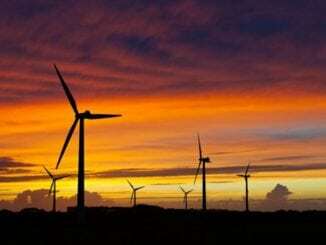 But one fact is certain: As margins for wind farm operators continue to be squeezed, every last bit of efficiency is vital to maintain profitability, and a vital tool to help achieve that is the improved prediction capabilities of statistical CMS.